Getting Lost IS Good! RM Pagi Sore Kalimalang Proved It. Fun Fact: The last three posts – Keuken Food Festival, Gudeg Yu Nap, and including this – they all happened only in 1 day. True story. It all started with a tragedy. We were on our way back driving from Bandung to Jakarta. Long story short, we were supposed to take the exit toll road at Bintaro (South Tangerang), but one thing led to another, and my dear friend took the wrong exit to..... Bintara (Bekasi) instead. I KNOW, RIGHT?! Hahaha I swear it’s one of those awkward moment when everyone inside that car just stared stupidly and did nothing but laugh. Luckily my friend happens to live in Bekasi for 10 years before she moved in to South Jakarta, so we knew our way out. In the midst of hunger (already), we looked up to our right side, and voila. That’s where RM. Pagi Sore Kalimalang came to our rescue! RM. 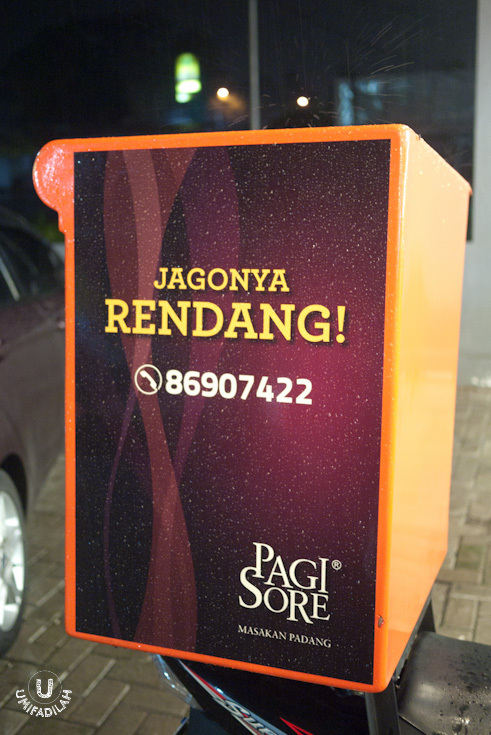 Pagi Sore was first established in 1973, and ever since, has been famously known as one of the tastiest Padangnese cuisine franchise other than (of course) RM Sederhana. The one at Kalimalang branch occupies a really huge space, with modern interior dominated in light brown woods, and also bright lighting. In fact, this might be one of the cleanest Padang restaurant ever! Looked too hygienic I almost worried that they might spike the prices really high up to fine-dining class, but no. Don’t worry, once you’ve tasted the food, those price tags still make sense. 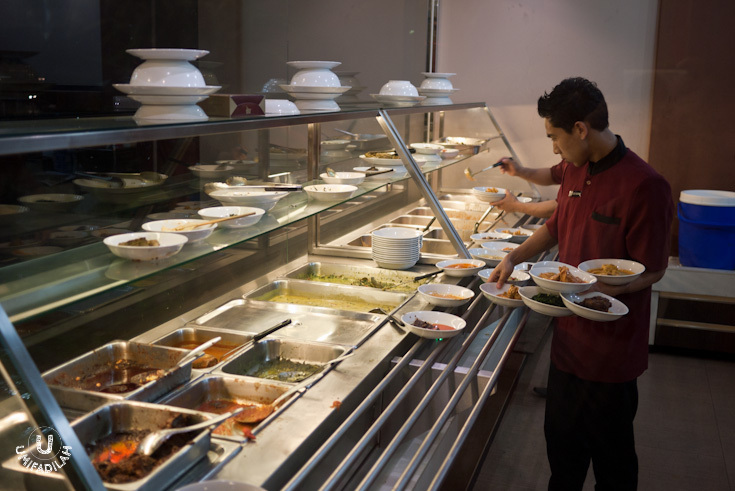 And just like any other Padang restaurant, once the wide array of small-plated food made it to our table, we were so overwhelmed with choices! Rendang Daging (IDR 14.000/pcs, 84.000/half kilos, 168.000/kg) – There is NO visit to Pagi Sore without tasting their infamous Beef Rendang. Enough said, this super-black thick rendang coating is to die for! 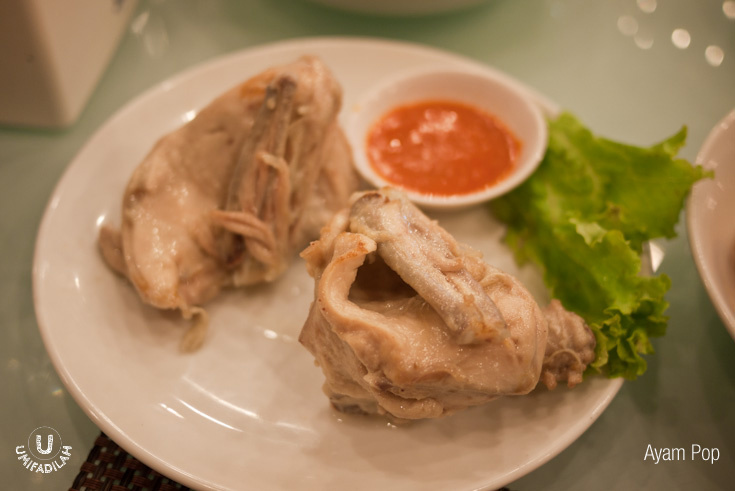 Ayam Goreng (IDR 14.000) – Just from the looks of it, can’t you tell that their Fried Chicken is really delicious? Love the crumbly batter! 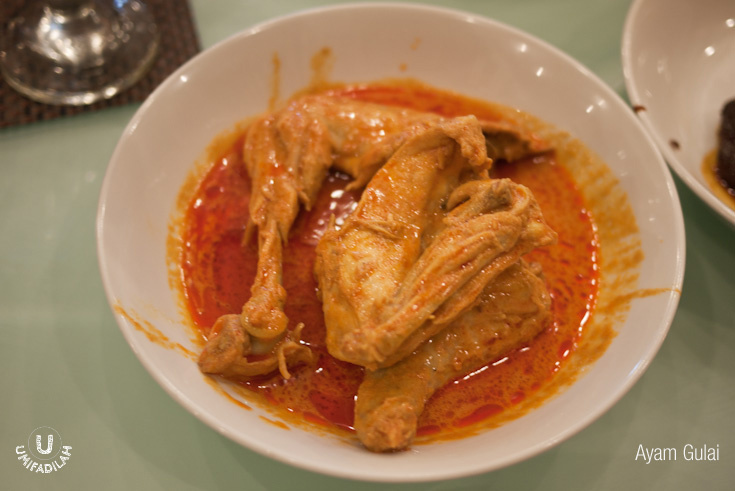 Also tried their Ayam Pop, Ayam Gulai, and Ayam Panggang (below) – not a single disappointing dish. Paru Goreng (IDR 14.000) – True, I don’t eat any of jeroan except for Paru (and a little bit of kikil :p) This was crunchy, not oily at all, just a perfect extra companion. 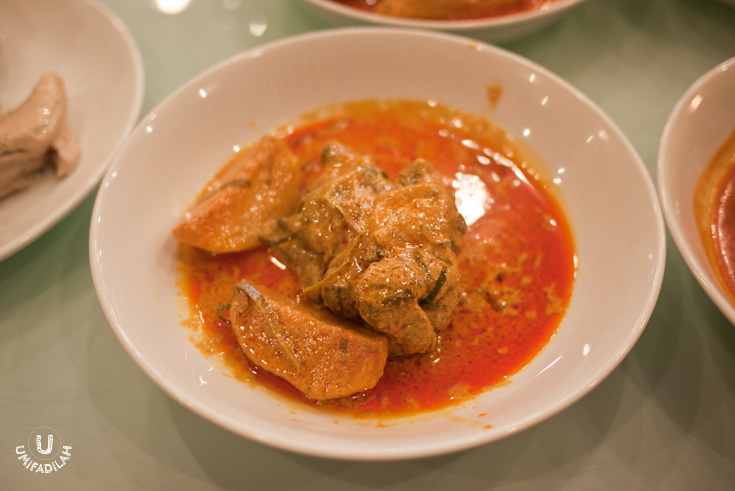 Gulai Otak (IDR 15.000) – Have you ever eaten cow’s brain? It’s quite a famous dish in Padangnese cuisine, they usually cook it on a curry-like broth with coconut milk. It’s far from yucky, its texture was so soft that everything just melts in your mouth. So yes, beware of your cholesterol level as this one is a real guilty pleasure in its purest form! 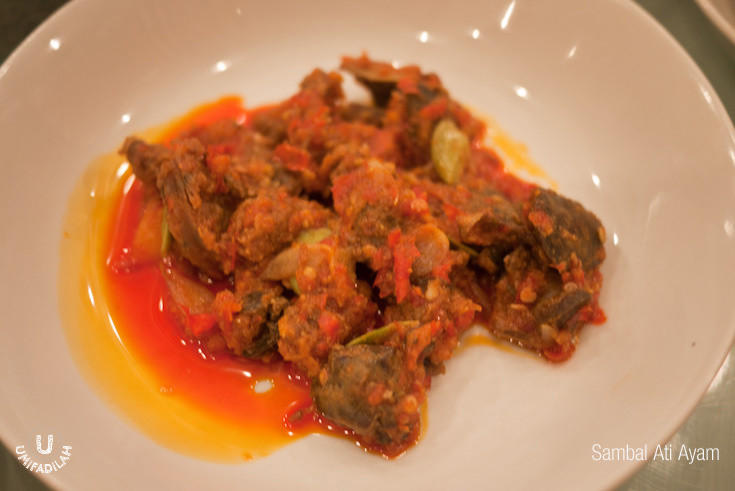 Gulai Kikil (IDR 15.000) – another sinful hi-cholesterol dish. Haha. Come on this is Nasi Padang! So is it OK? Yes of course! 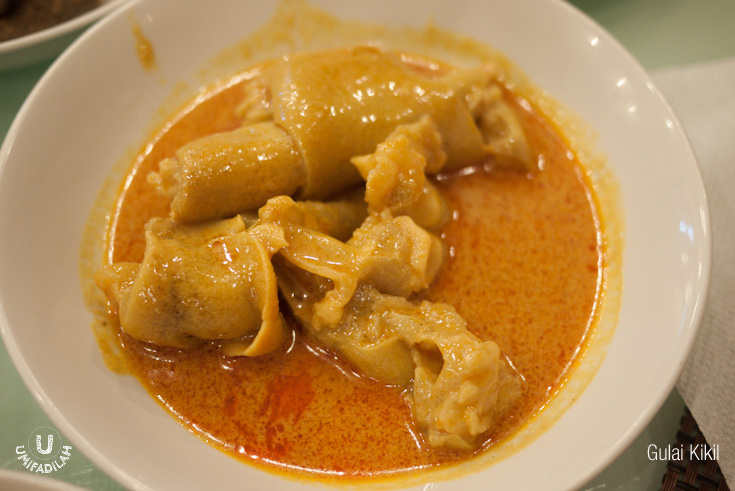 Gulai Daun Ubi Tumbuk (IDR 12.000) – translated as pounded yam leaves with a light curry-like soup. It’s a bit too salty for me, but the cure was easy: add more rice! LOL. APPARENTLY THAT’S WHAT I CALLED "BLESSING IN DISGUISE". Like old proverb says, when in doubt, eat Nasi Padang. Kidding – I made that proverb myself – but yes, fate brought us to Nasi Padang that night, before we all came home and close the tiring (makan) day. So yes, getting lost IS indeed a good thing, because things such as "blessing in disguise" DO exist in real life. Move on, people. We should do another roadtrip again!